#58 featuring the return of raxil4 a.k.a Andrew Page who has appeared at a variety of SKRONK events. This time we asked him to bring a big band the raxil4chestra. 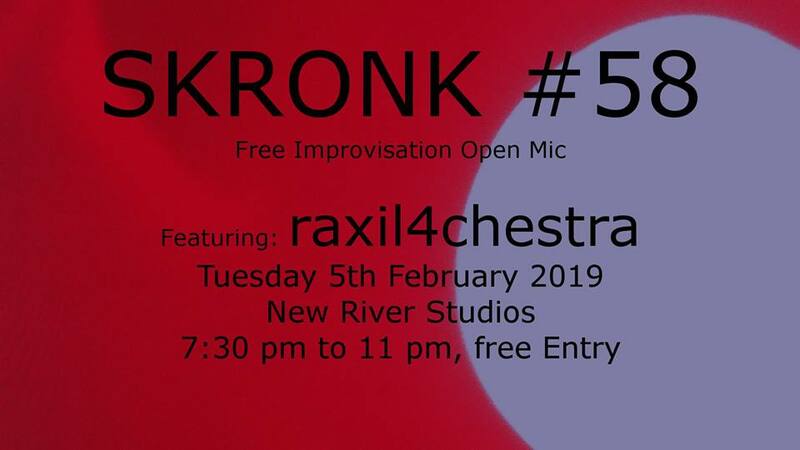 Featuring Emilie Newman on Viola, Sam Enthoven on Theremin, Hywel Jones on Euphonium and Jasmine Pender on Cello/electronics and she’s someone I’ve wanted at SKRONK for a while so very, very happy with that line up. And you too can come and join the open improv session, bring an instrument and you’ll get allocated others to perform with.